After the tour in Apo Reef and Calaguas last May 2015, I was thinking of another tour. Initially, I thought of going to Camaya Coast and Acuzar in Bataan. Last minute, I changed my plan and decided instead to go back to Fortune Island. Relived my last year's adventure in this uninhabited white sand beach island. And that was the first time I joined JJ Tours. I ended up joining the JJ Tours in Fortune Island. But this tour was different. I'm usually with Rico (my travel buddy) but this time I was with Faty Wines (co-teacher in FEU). I told her she needed this tour as part of here preparation for the Mindanao Tour slated likewise on the same month. She happily obliged. We paid P2,700 each for the said tour and it was worth every penny of it! There a variety of options in going to Nasugbu, Batangas. Ride a BSC or DLTB bus en route to Nasugbu, Batangas. Travel time is 3-4 hours. It is 92 kilometers from Pasay. Fare is P155.00. Alight in Jollibee, Nasugbu, Batangas. Then, ride a tricycle to Barangay Wawa for P10.00 only. Specifically, in Fortune Island Resort. Ride a DLTB bus en route to Nasugbu, Batangas. Travel time is 3-4 hours. It is 94 kilometers from Buendia. And the fare is also P155.00. Alight in Jollibee, Nasugbu, Batangas. Then, ride a tricycle to Barangay Wawa for P10.00 only. Specifically, in Fortune Island Resort. Ride the bus going to Nasugbu (they have a schedule and it is better to inquire), Travel time is 3-4 hours. Fare is P173.00. Alight in Jollibee, Nasugbu, Batangas. Then, ride a tricycle to Barangay Wawa for P10.00 only. Specifically, in Fortune Island Resort. Ride the bus (DLTB) going to Nasugbu. Travel time is 3-4 hours. Fare is P173.00. Alight in Jollibee, Nasugbu, Batangas. Then, ride a tricycle to Barangay Wawa for P10.00 only. Specifically, in Fortune Island Resort. From SM Calamba, ride the van going to Tagaytay and alight in Jollibee, Olivares. Fare is P70.00 and travel time is more than an hour depending on the traffic. From Olivares, ride either the jeepney or bus going to Nasugbu, fare is P78.00 and travel time is 60-80 minutes. Alight in Jollibee, Nasugbu, Batangas. Then, ride a tricycle to Barangay Wawa for P10.00 only. Specifically, in Fortune Island Resort. Ride the jeep going either to Talisay or Laurel, Batangas. Fare is P23 and travel time is less than an hour. Alight at the Municipal Hall in Talisay and board the tricycle to Banga. Reaching Banga, ride the jeep (P40), motorcycle (P150) or tricycle (P300) to Tagaytay. Travel time is 15-20 minutes only. Alight in Olivares, ride either the jeepney or bus going to Nasugbu, fare is P78.00 and travel time is 60-80 minutes. Alight in Jollibee, Nasugbu, Batangas. Then, ride a tricycle to Barangay Wawa for P10.00 only. Specifically, in Fortune Island Resort. Hire a van going to Nasugbu. From EDSA- Buendia MRT Station, we rode a van to Nasugbu, Batangas. Travel time that morning was only 2 hours less the traffic. We alighted at Fortune Island Resort. Fortune Island Resort is the one managing ALL the tours in Fortune Island. They also provide scuba diving and island hopping tour. They also have ATV rentals. It is co-owned by Mr. Kim and Mr. Steve whom I both met in the resort. It is BETTER if the resort will be the one to ARRANGE your boat to the island. If you are traveling alone or 2 or more, they will the the one to squeeze you in other tours. Look for Maricel, Jenny or Erika. Best time to visit the island is between the months of March to June only. It is better to travel in a large group (8-10 pax) to minimize the cost of renting a boat. Jenny is the one wearing blue and Maricel is wearing gray inside the bar. Red Chuca arranged the tour, food, and the boat rental. Again, please look for Maricel or Jenny at the resort. Past 7 am, we were boarding the boat en route to Fortune Island. Travel time by boat to the island is more or less 1 hour depending on the weather. There is a helipad in the island. After 30 minutes, we could already see the island. And after 1 hour, we arrived at Fortune Island. It was my second time to see the island. The beach is white sand. There are portions of the beach with powdered white sand and there are portions with rough white sand and shells abound in the shore. 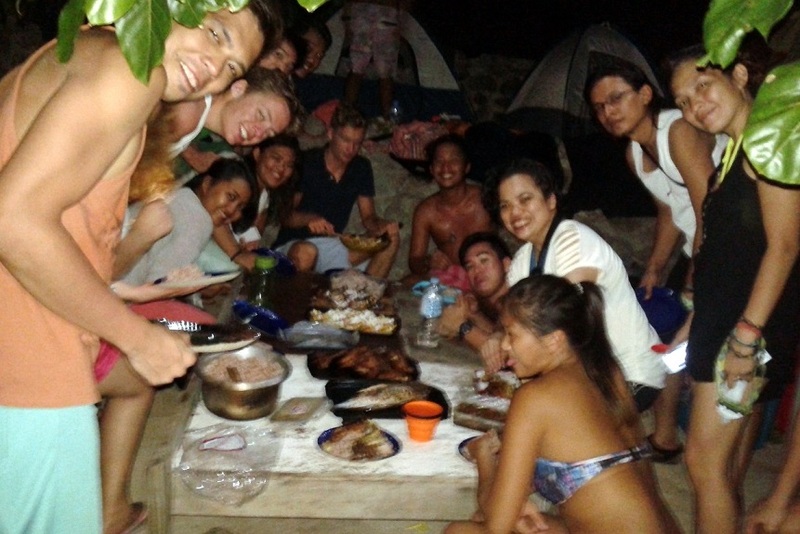 Aside from our group, there were 7-8 other groups who will spend the night in the island. We went to our camping site. But Faty and I decided to go immediately to the top of the ruins in order to take advantage of the blue sky and sunny weather that day. From the top of the ruins, you can have the bird's eye-view of the island. I thought I was in Parthenon in Greece! The Parthenon is a temple on the Athenian Acropolis, Greece, dedicated to the goddess Athena, whom the people of Athens considered their patron. Then, we went further to the highest point in the ruins and explored it. Behold the ruins of Fortune Island! Fortune Island is a photographer's dream! A sight to behold and get lost! After taking a multitude of pictures, we decided to descend. After taking lunch, we rested for 2 hours and then headed to the other side of the island. The trek was good only for 10-12 minutes. The landscapes in Fortune Island are breathtaking! And the site was the site for CLIFF JUMPING or CLIFF DIVING! First to jump was Matias (German) followed by Alfred who jumped with his GoPro! Erwin, Basil, Dana (Natalie Del Rosario), Dolly, and Norry also jumped! Last to jump on our group was Norry. But aside from us several groups jumped that day. Noteworthy is the group from Baguio City. The most beautiful girl to jump that day was from Baguio City! And I was not able to get her name, (per comment, her name is Justine Nicole Sison). After cliff jumping, we decided to go to the other spot for cliff jumping. But this one is not as high or dangerous as the previous one. It is located just beside the beach area. Again, we rested fro 1 hour and thereafter, headed to the shark infested area. But after waiting for nearly an hour, not a sight of a shark appeared. Instead, we went back to the beach area and enjoyed the waters of Fortune Island. And the best part of it was - SNORKELING! You will love the corals of Fortune Island! While the rest took their souvenir pictures. Past 5 pm, we went back to the top of the ruins. But this time for sunset viewing. I met a group who were also waiting for the sunset to unfold. I forgot their names. Around 5:50 pm, sunset was in the horizon. The sunset in Fortune Island is quite different because it is situated beside the cliff and you have to be creative to get your own shot. Then, later that evening, we took our dinner. After dinner, the drinking spree. A lot happened before, during, and after the drinking spree which I am not at liberty to say. We played several games and Denise emerged as the victor. It rained twice that night. Woke up thrice that night. There was no sunrise the following morning. But we still enjoyed the breakfast the following morning. Around 10 am, we headed back to Nasugbu mainland. We fixed ourselves and headed back to Manila. We made a stopover in Mahogany Market in Tagaytay City for our lunch. And I alighted in Olivares. MORE FUN IN FORTUNE ISLAND! According to the locals, it is owned by Mr. Leviste. There is no electricity nor drinking water in the island. No food outlet or canteen. But it has mobile network signals of Smart and Globe. There is a toilet but there is no water. It is better to bring your wet wipes or use salt water for toilet purposes. There is a lighthouse in the island and a helipad. Fortune Island Resort, Apacible Blvd. 1. 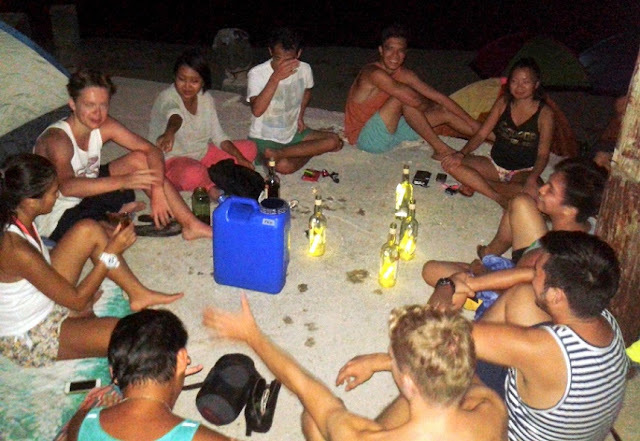 It is better to negotiate your rent of the boat directly to Fortune Island Resort..
2. It is better to bring supplies of water in the island. 3. There is no tent rental in the resort or island. Please bring your own. Using hammock is neither an option. Sleeping bags can be used as there are dilapidated shelters in the island. 4. The waves can be so strong that you will get wet while boarding or onboard the boat, better bring a spare clothing just for this purpose. 5. Do not forget to bring a camera! Enjoy Fortune Island! kelangan ulit ulit uli ulit? 3x? Hi! Yung DLTB po sa Cubao, daily trips to Nasugbu? Same din po ba ng babaan (Jollibee) kung sa Punta Fuego po kami? Thanks! YES GOT THERE/// SO NICE## its a worth trip..
Hi! Wala na ba kayong trip somewhere this month between 15 an 19? How much po ang budget for this incoming December trip? Hi there! Just curious san pwede maligo sa island since walang supply ng tubig? Dun na ba mismo sa Fortune Island resort? Ung DLTB bus is dadaan ng tagaytay, tama ba? It was a packaged tour organized by Red Chuca. You can look for him in facebook. hello po.. ask ko lang po kung anong covr ng entrace fee sa fortune island.. kasi Ive read alot of blogs at sabi wala namang amenities sa isla.. may resibo ba to kasama??? but one of my concerns would be on the commute. btw, would you know schedule interval of dltb bus cubao going to nasugbu. Their posted contact numbers seem outdated. Sir, allow me to copy your options in going to Nasugbu to my travel blog www.lexicalcrown.blogspot.com. Thanks. Hi. I would like to ask if you are entertaining interviews? Because your blog post is related to our thesis topic. Thank you. Hi!inquire ko po kung saan mismong pwedeng bumaba pag nasa nasugbu na?yung jollibee nasugbu po ba malapit na yun sa nasugbu public market ? And kung straight na madadaanan po ba ang jollibee?salamat po..
WOW! This made me feel more excited about our move to our news bought house for sale in Batangas.